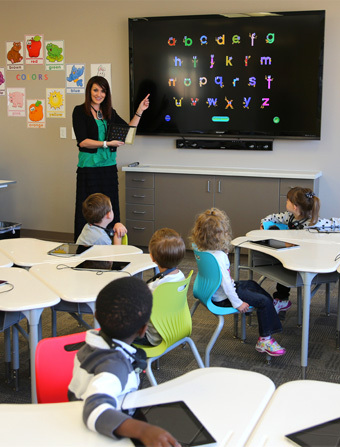 iSchool Campus deploys a robust wireless network that provides high-speed connection to every device in the classroom. Our wireless network is the magic ingredient that keeps everyone connected with fast, easy access. We are able to support large-scale, high density environments with high throughput and seamless connectivity using channel blanket technology, advanced configurations, and maximized backbone infrastructure. Leave it to our professionals. Every wireless management switch is configured by our highly trained wireless specialists and tuned to the physical environment of the school creating a tailored system that eliminates the majority of problems schools typically face when attempting to deploy technology. And with our support system, those professionals have you covered to ensure everything is running at peak efficiency. We’ve got your back. Providing high throughput over wireless requires a robust backbone infrastructure. We deploy a full gigabit wired network to support the wireless infrastructure, but we don’t stop there. We’ve researched hundreds of gigabit switches to find the fastest and least expensive option available, providing even higher throughput. To maximize speed, a highly trained networking specialist configures each switch to provide maximum throughput.